Our company vehicle will pick you from your hotel early in the morning and join the group. At this point you are introduced to your guide and other people in the group. We arrive at Tsavo West national park in time for lunch. Relax at your lodge up to four in the afternoon when your driver picks and leads you for the afternoon game drives for. Spot the mane less lions in the park and many other animals. Return for dinner and overnight. The group is headed to Amboseli national park via game drive. A stop at the famous Mzima springs is guaranteed before the van joins the security convoy at 9.30am in the morning. The group arrives in time for lunch. Your guide will pick you from your lodge for the afternoon game drives. You will have a chance to see the biggest herds of elephants. Get the great views of Mt Kilimanjaro the highest mountain in Africa. Afternoon game drives and return for dinner and overnight. Depart via game drive after your breakfast and head to Tsavo East National park. You arrive in time for lunch and check in. Afternoon you have your game drives and visiting the Aruba dam. This is the park famous for man eaters of Tsavo. You return late in the evening for dinner and overnight. Enjoy early game drives at Tsavo national park. Return for breakfast, departing later for Mombasa town. It’s now your time to share with your driver your new experiences. 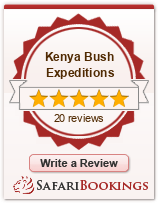 Our driver will give you our feedback form to fill so that our office can sample your views of the safari.